Zayne Harshaw has autism. He also has a passion for music and an incredible talent for playing the guitar. In 2013, he founded the band Blue Spectrum. Since then, he’s been living the dream, playing for people throughout Ohio, across state lines, and hopes to one day use this gift to inspire others around the world. Young adults can enjoy a new mix of music as Gahanna’s Creekside Blues & Jazz Festival marks its 20th anniversary. “Every year, we strive to add a new component to the Creekside Blues & Jazz Festival, that not only freshens the event for fans who attend year to year but also has the potential to expand our audience reach,” said Laurie Jadwin, executive director of Gahanna Convention & Visitors Bureau, also known as Visit Gahanna. Visit Gahanna serves as the producer of the festival, to be held June 15-17. The stage will be in the Family Fun Zone in Gahanna Veterans Memorial Park, 73 W. Johnstown Road. On June 15, Cousin Simple, one of central Ohio’s hottest young bands, will take the stage and perform from 7 to 8:30 p.m.
During the day June 16 and 17, the stage will feature a variety of family-oriented, interactive performances, including Jazz4Kids, Endless Recess, the Irwin Academy of Irish Dance and the Gahanna branch of the Columbus Metropolitan Library. Youth can listen to the music of Blue Spectrum from 7:30 to 9:30 p.m. June 16, featuring guitarist and Gahanna resident Zayne Harshaw. Harshaw, who was diagnosed with autism at age 4, expressed an interest in playing the guitar as a young teen. Harshaw brought his skills to the 2016 Creekside Blues & Jazz Festival when he was invited to sit in with three acts. The 22-year-old since has traveled as a solo artist and with his band, Blue Spectrum, to Memphis, Tennessee; Harrisburg, Pennsylvania, Rockville, Maryland; San Antonio, Texas; and to cities throughout Ohio. In addition to Harshaw, Blue Spectrum members are keyboardist Amelia Walsh, vocalist and bassist “Uncle Al” Jefferson and drummer D’Arco Smith. He said he wants his hometown to know him. Harshaw said he used to play in the park and ride the rides during the festival. “I also like the chance to play in front of an audience around my age,” said Harshaw, whose guitar influences include Yngwie Malmsteen, Stevie Ray Vaughan and B.B. King. Endless Recess will close out the Discovery Stage on June 17, between noon and 4 p.m.
Jadwin said the festival’s musical lineup has grown from blues to blues and jazz, and now includes an eclectic mix that includes rock, bluegrass, country, acoustic, big band and more. “Our Giant Eagle Family Fun Zone has grown to feature interactive workshops and performances with local musicians that introduce our youngest festival fans to the world of music,” she said. Given its location in the Family Fun Zone area, there is no charge for attendees to catch the performances of these bands and groups during the weekend. Festival hours are 5 to 11 p.m. June 15, 11 a.m. to 11 p.m. June 16 and noon to 6 p.m. June 17. Admission is $7 on June 15 and 17 and $10 on June 16. Children under 12 and members of the military, with their immediate family, presenting military identification are admitted free. A complete lineup and additional information are available bo going online to creeksidebluesandjazz.com or by calling Visit Gahanna at 614-418-9114. Zayne Harshaw’s musical inspiration often comes in the middle of the night, which used to annoy his parents. However, Gene and Gwen Harshaw have learned to sleep through most of their son’s guitar riffs. They even encourage the early-morning jam sessions. “You know what? It’s what he likes to do,” Gwen Harshaw said. The Gahanna couple can thank the instrument and music — mainly, the blues — for bringing Zayne out of his shell, giving him confidence to succeed in school and adding a richness to his life that they never thought possible when he received a diagnosis of autism at age 4. And a large group of musicians have become part of their “parenting” village, to whom they’re indebted for fostering Zayne’s musical talents. This weekend, Zayne will perform with some of his mentors at the Creekside Blues & Jazz Festival in Gahanna; it begins on Friday — Zayne’s 21st birthday — and ends on Sunday. The annual event draws about 35,000 people to hear more than 90 hours of jazz and blues on five stages. Zayne Harshaw will perform three times: on Saturday with Dock Adams & Blues Hammer and with the Will Freed Trio, and on Sunday with Sean Carney. Performing used to be “nerve-racking” for him, he said, but he has found his stride in front of an audience. “Now, I want everyone paying attention to me,” said the 2014 graduate of Oakstone Academy. “I love it when they go crazy, too — I want to blow them away. At the time of diagnosis, doctors didn’t give his parents much hope that he’d be able to show off anything. Gene Harshaw said he and his wife went through a grieving process for all the things they felt their younger son might never do. They focused on finding the best medical care, but he added, with regret, that they found it difficult to set aside time to nurture his personality and passions. His parents thought it might be a phase, but Zayne delved into music. He formed a band called Blue Spectrum with other young people with autism. 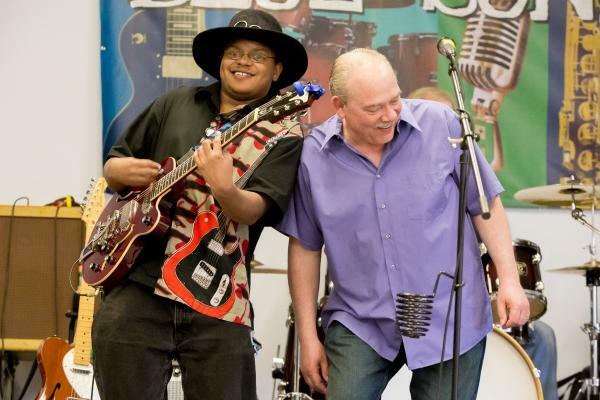 In 2014, Zayne’s life changed when he attended CAMP Blues with the Jazz Arts Group. He gained a new appreciation for the blues and met the musicians who would become his mentors. Now, he attends weekly jam sessions, performs at venues around Ohio and was selected to perform at the International Blues Challenge in Memphis. Gahanna musician Will Freed had never met Zayne before agreeing to play with him at Creekside; after hearing the young man play, he’s thrilled by the opportunity. “Zayne hits very few wrong notes, and he hasn’t been playing very long,” Freed said. tart with Jimi Hendrix. Add some Yngwie Malmsteen and Tom Morello, with a dash of Slash and a little bit of Kiss and you have blues guitarist Zayne Harshaw. Ripping out slabs of blues-drenched guitar solos that Buddy Guy or Jimmy Page would be proud of, Harshaw puts his own take on the music he loves. Harshaw, 19, has five guitars, a multitude of effects and a Fender amplifier. He got interested in playing guitar through playing the video game “Guitar Hero.” He also plays with a band, Blues Spectrum. Harshaw lives in Gahanna, but is booked for several dates this summer at the Square Seven coffee house. He also works at Fairfield Medical Center. Making Harshaw’s musical feats even more remarkable is the fact that he was diagnosed with autism at age 4. One time during those two years, the family heard Hendrix blasting out of Zayne Harshaw’s room and thought he was listening to the stereo. But he was actually playing the music on his guitar. “I went upstairs and saw it and couldn’t believe what I was hearing,” Zayne Harshaw’s father, Gene, said. The family then enrolled him into a guitar class where the instructor discovered he had perfect pitch. That means he can recognize the exact pitch of a note without using a reference note. Though only 19, Harshaw knows what he wants his future to look like. For the short term, Harshaw wants to add vocals to his musical ability. Besides guitar, Zayne Harshaw also plays the trumpet and bass guitar. He is also a major fan of Kiss and has dressed up as guitarists Ace Frehley and Paul Stanley for Halloween at times. “I haven’t got a chance to see them, but I know they’ve been traveling a lot,” Zayne Harshaw said. He also listens to Rage Against the Machine, which is Morello’s band, the Red Hot Chili Peppers and Metallica. He said he also enjoys hanging out at Columbus guitar stores like Guitar Center and Sam Ash.